In the summer of 1897 Henry and Sarah arrived in the Arizona Territory. They brought with them 5 children and Henry’s widowed mother, Mary Ann (“Gaggy”). The family was living in Oklahoma when Henry received word from his cousin Fred Haught that the country in Arizona was good. Fred was the first Haught to arrive in Rim Country. He bought several parcels of land and encouraged relatives to join him. Henry and Sarah began ranching on the Ellison Creek property Fred had purchased from settler Jesse Ellison. In 1902 the property was sold to the Goswicks. Henry and his family had to move. They took up residence on the Elam Boles place on Roberts Mesa. The property had a spring which was reported to never run dry. The Haught’s cabin measured 10′ by 18′. It had a dirt floor and no windows. By 1909 the spring said to never run dry finally did. Henry attempted to restart the water flow with a dynamite blast. It didn’t work. The family was forced to move. Henry purchased land on Tonto Creek. Log by log they moved the little log cabin from the Boles property to the new location. In 1914 their 22 year old son Sam took over the Tonto Creek property. Henry and Sarah moved to Little Green Valley. They had traded 100 yearling heifers for squatter’s rights on 144 acres, receiving a patent on the land in 1919. 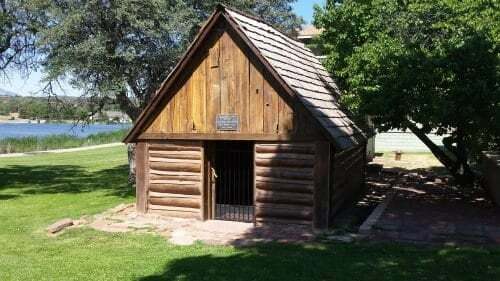 The little log cabin remained on Tonto Creek. Sam used it as a storage room for hanging and drying meat. A ceiling was installed with insulation of mud and grass and the pitched roof was replaced. The cabin’s interior stayed approximately 15 degrees cooler than outside temperatures. From about 1921 to 1924 Henry and Sarah’s daughter, Ida (“Sis”) and her husband, Henry Garrels, lived in the log cabin with their 5 sons. By the 1930’s the little cabin was deserted. Larry Hammon acquired the property in 1999. Mr. Hammon contacted Rim Country Museum to see if there was any interest in relocating the structure. Volunteers from the museum numbered and sketched each board and pole before taking the cabin apart. Dismantled, it was relocated to Green Valley Park and reassembled on the museum’s grounds where it now stands. The cabin is open to the public as a free exhibit.